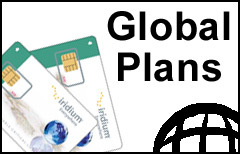 Iridium Global Prepaid Plans | call as low as $0.84/min. Iridium Global plans feature one flat rate for the entire coverage area. The most popular choice is the Global 500-min voucher with 12 months of validity. For short term heavy users the Global 750-min can be a great option. If you expect to use your Iridium phone extensively, consider higher usage plans with rates 30-40% lower. All incoming calls are free for the Iridium subscriber (but not for the caller! ), except for two-stage dialing calls, which are charged at the outgoing call rate. Each prepaid voucher has Validity Time, a period of time by which the voucher extends the validity period of Iridium prepaid account. All prepaid minutes and other airtime will be expired from the account upon the end of the validity time term, unless a new voucher is loaded to the account before the expiration date. * Minutes in 300- and 750-min plans cannot be rolled over. All unused minutes will expire after the initial validity period ends. Upon expiration or depletion of initial minutes, the same account can be reloaded again with any Iridium prepaid voucher. Maximum Age Limit: a period of time during which the minutes from a prepaid voucher can be kept on a prepaid account and used by the customer. The age limit for most vouchers is 3 years. If a voucher is not rechargeable, all minutes will be expired on the account expiration date. Do not purchase a new plan if you want to add more minutes to or extend your existing Iridium account with SATTRANS. Get a new Iridium airtime voucher instead.